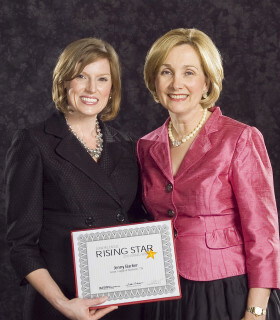 Rising Star Jenny Barker’s can-do attitude and relentless dedication to the community is well known in Nashville. She assisted Nashville’s Agenda 2007, a city-wide, non-partisan goal-setting project by mounting a public relations strategy that recruited ideas to improve the community from every sector of the city. In addition, she was selected to participate in the highly competitive Nashville Emerging Leaders program, which engages and nurtures future leaders through personal development, mentorship, and access to Nashville’s top community and business leaders. Barker excels in marketing and communications. As a first-year Active, she led the communications effort for the League’s inaugural holiday marketplace and secured a $50,000 media sponsorship from the city’s leading daily newspaper, as well as one from the top-rated television station—both of which helped draw 4,000 attendees and net a total income that exceeded the League’s goal by $20,000. Her work earned her the Junior League of Nashville’s First Year Active Award. As a second-year Active, she was appointed to a three-year term on the Home Board, one of the oldest and most sought-after placements in the League. Her success in coordinating the “For Santa’s Sake” gift drive landed her a seat on the board of Oasis, one of the League’s partner agencies. Whether the issue is sheltering the homeless or improving adult literacy, Barker shows a deep appreciation for all people, and reaches within herself to serve them to the best of her ability.